Alan Pardew’s dealings in the transfer window had a distinctly Gallic feel, and to celebrate, Newcastle’s weekly paper rebadged itself as ‘Le Journal,’ while the football club themselves distributed tricolour-style red, white and blue cards for supporters to hold up and played the French national anthem before kick-off. This was literally music to the ears of Morgan Schneiderlin as well, and he responded by giving Saints a third minute lead following a superb knock-down by Lambert as the visitors started in confident mood. It took a considerable time for the home team to edge their way into the game, but their rangy forwards always looked likely to trouble Southampton’s back line, and when Gouffran got round the back of the right flank, his shot rebounded off Boruc’s shins into the path of Sissoko for an easy goal. Newcastle actually ended the half in front, but in controversial circumstances: the BBC has shown that Cissé was offside before his spectacular volley to finish off a classic route one goal after a free kick, but why the kick had been given against Saints in the first place remains a mystery. Elliot pawed away a Lambert free kick in the opening minutes of the second half, but Rickie wasn’t to be denied his 100th Saints goal as he applied the finish to Lallana’s low cross shortly afterwards. In retrospect the game changed when Fox had to replace Shaw, as the substitute was caught out by another Newcastle long ball and ended up handling Debuchy’s cross. At this point I have to apologise to Maya Yoshida, who I thought had handled (and I did say some bad things about him) – but Saints’ management should also be reflecting how Shaw had been similarly exposed when Cissé scored, and be asking why the centre backs weren’t attacking the ball instead. Cabaye scored from the spot to put the Mags in front, and they put the game beyond Saints after another Fox calamity – his attempted clearance hit Hooiveld at point blank range, and there was nothing the Dutchman could do about adding to his impressive tally of Premier League goals in the wrong net. Southampton’s good play was mostly confined to the early parts of both halves, and they were eventually outplayed after contributing a good deal to the game. 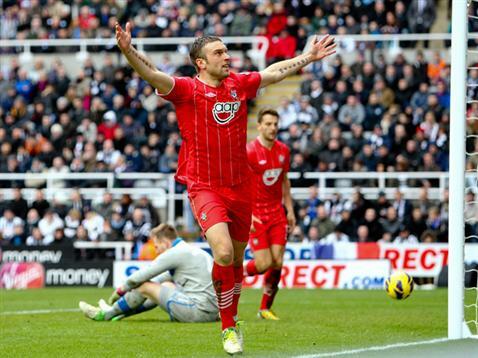 LSSC Man of the Match: Rickie Lambert for a goal and a fine assist as well.